Vito is trembling while spying the state of the tea party. From the leaders from across the world, there are monsters such as the eldest son and Candy Minister Perospero, eldest daughter and Fruits Minister Compote, second son Katakuri, 14th daughter Smoothie, 3rd son Daifuku, and the 4th son Oven. Vito: "I thought I felt reassured with our allies, but I shudder that the thought of being surrounded by all these enemies-rero"
On the table lies a picture of Carmel. A first time guest inquires about the relationship between Big Mom and Carmel, and she gets furious about someone trying to encroach on a person's memory. The bosses give a mountain of presents in an attempt to put her into a good mood. In front of the venue, Bege's men report that they've blocked all the routes to the venue. They also report that they've completed jamming all communications with the horned den den mushi. Bege produces from his body the mirror that they will use with Caesar to escape. 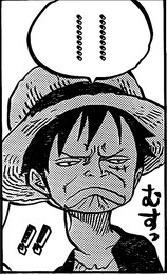 He sees everyone fast asleep when he looks into his body to confirm Luffy's condition. Jinbe communicated to him to wake everyone up ten minutes before the operation began. An annoyed Caesar once again goes back inside his body, and Bege continues on by himself. In the bride and groom waiting room, Pudding approaches Sanji. Even though he knows it's all a lie, he goes heart eyes. Sanji and Pudding enter the venue. Again : Pas de chapitre . Ça va être une des pires semaines d'attente pour moi.